I thought that the concept of this book was a really intriguing one. Rynah was a character who was easy to relate to and empathise with. Even when she was kind of mean to her allies, she had reasons for acting the way she did… even if those reasons weren’t necessarily good ones. I thought it was interesting to read about the prophecy and how Solaris took the people who were in the prophecy from Earth’s history. 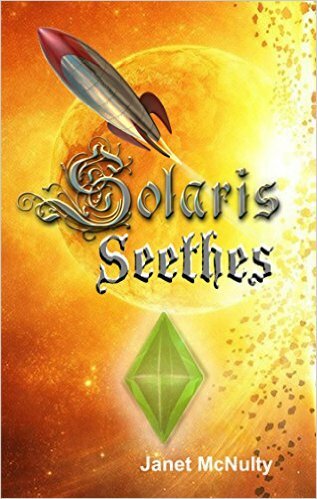 Although there wasn’t as much of a culture shock as I was expecting (I thought Alfric and Solon would have trouble dealing with suddenly being in space), I actually found myself growing quite fond of all five of the main characters… six, if you count Solaris. I had a lot of sympathy for Brie in this book. Although she did only want to go home, I felt that she still demonstrated good qualities. There were times when she acted and did the right thing and I felt that Rynah was completely unfair to her. She wasn’t a warrior… but she fit the time frame she was from; just like the other characters did. One particular thing I thought worked quite well was the similarity between the myths… such as Heracles and Herclai (I think that’s the correct spelling) having a lot that’s the same. It was good to see friendships forming between many of the characters, such as Alfric protecting and caring for Brie. I thought there was a lot that was sweet about the way he tried to encourage her to stand up for herself. And I really liked Solon and his calm nature. I did notice quite a bit of repetition in this book. Some descriptions were repeated… and the ‘As you know’ explaining device also made an appearance. There was also a lot of summarising during the narration, rather than things being revealed through dialogue… or even flashbacks. I would have liked to see a bit more expansion of Klanor’s motivations, since the best villains are always those who have more depth to them. I really liked Solaris’ character and the friendships that formed between the ship and the humans. I can definitely see myself reading the next book in this series at some point in the future.